Scollay Square, looking north from the corner of Tremont and Court Streets, sometime in the 1860s. Image courtesy of the Boston Public Library. 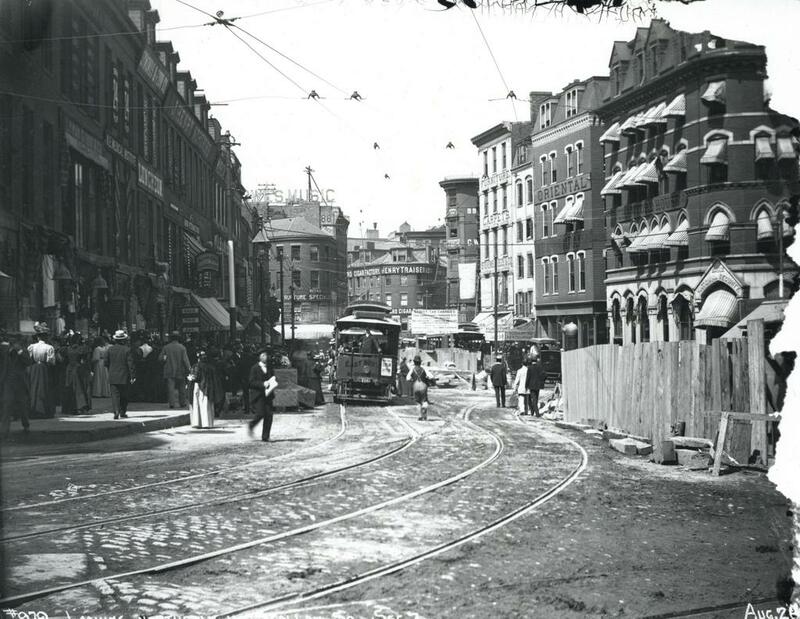 Scollay Square on August 26, 1897. Image courtesy of the City of Boston Archives. 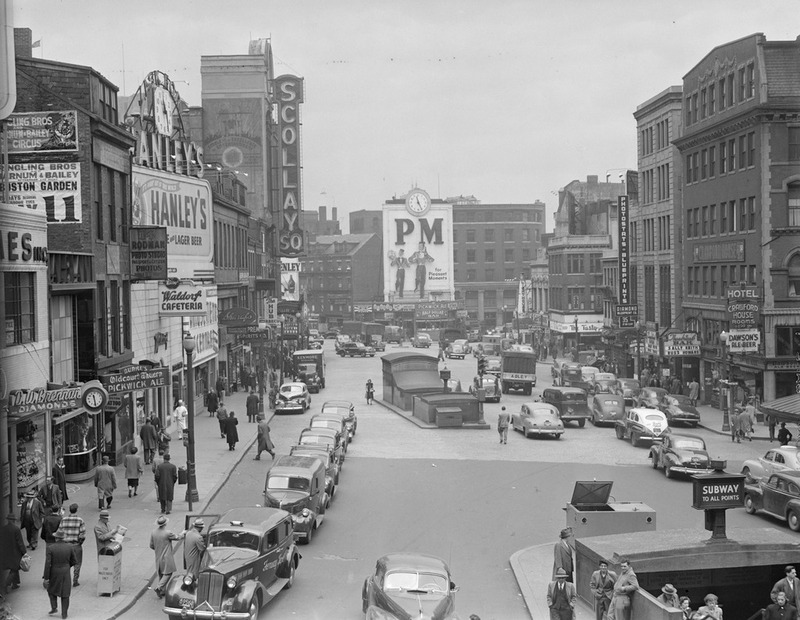 Scollay Square around 1942. Image courtesy of the Boston Public Library, Leslie Jones Collection. These four photos reveal the dramatic transformations that have occurred at Boston’s Scollay Square over the past 150 years. The square once included a long, narrow row of buildings in the middle, which appear on city maps as early as the 1720s. 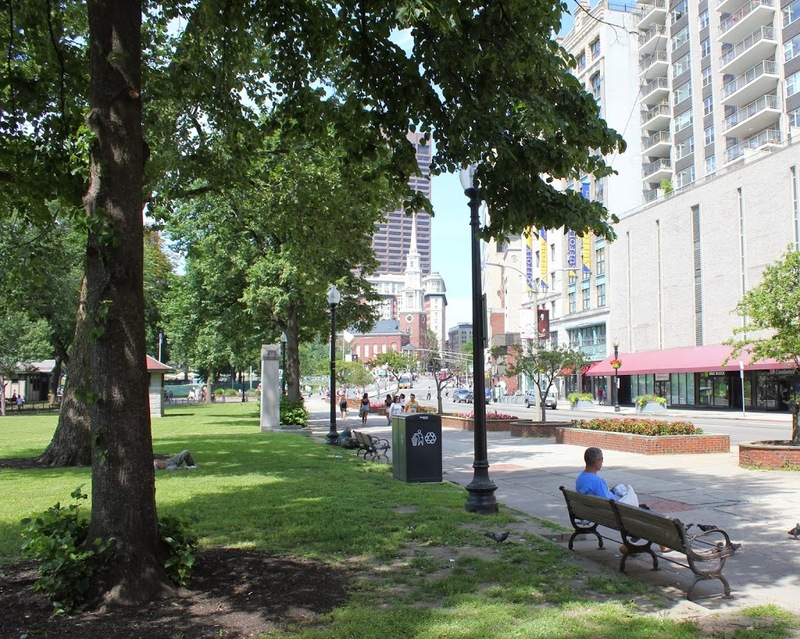 The construction date for the building in the first photo is unknown, but it was once at the southern end of this row, and in 1795 it was purchased by William Scollay, a real estate developer for whom the square would eventually be named. 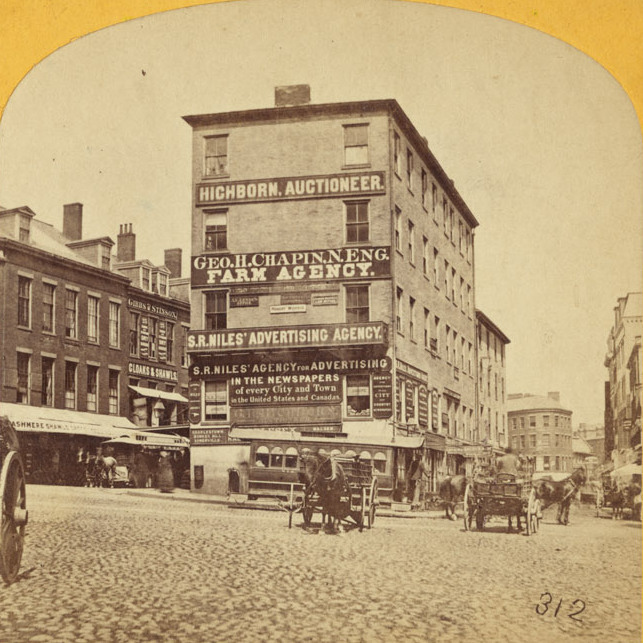 By the time the first photo was taken, all of the other buildings in the middle of the square had been demolished, and Scollay’s building was taken down soon after, around 1870. The second photo shows a very different scene. 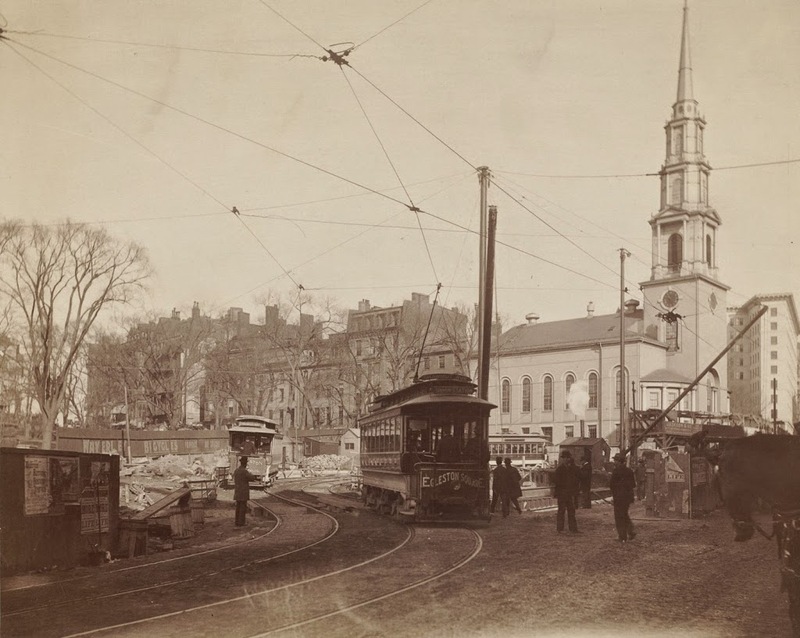 Some of the buildings along the square are still standing, but the Scollay Building is gone, as are the horse-drawn trolleys from the first photo. Instead, they have been replaced by electric trolleys, like the one shown in the photo. However, these would not last long, at least not on the surface. The second photo was taken only about a week before the Tremont Street Subway opened, and the photo shows some of the construction activity as the workers prepared the Scollay Square station for its opening day on September 3. The station itself is not visible, but its ornate entrance can be seen in this post, which shows the scene from a slightly different angle. Scollay Square had long been a major commercial center in the city, but by the time the third photo was taken in the 1940s, it had seen a dramatic decline. Many of the old buildings were still standing, but the businesses had become seedier. The 1942 photo shows a number of bars, liquor stores, cheap restaurants, and burlesque theaters, and the area was particularly popular among sailors on leave from the Boston Navy Yard and college students from the many nearby schools. One prominent hotel and theater in both the second and third photos was the Crawford House on the far right. It was built in 1865 and underwent several renovations, including one in 1926 that completely altered the front. The building burned in 1948, and all but the first two floors were demolished a few years later. By the 1950s, the area was being targeted for urban renewal. 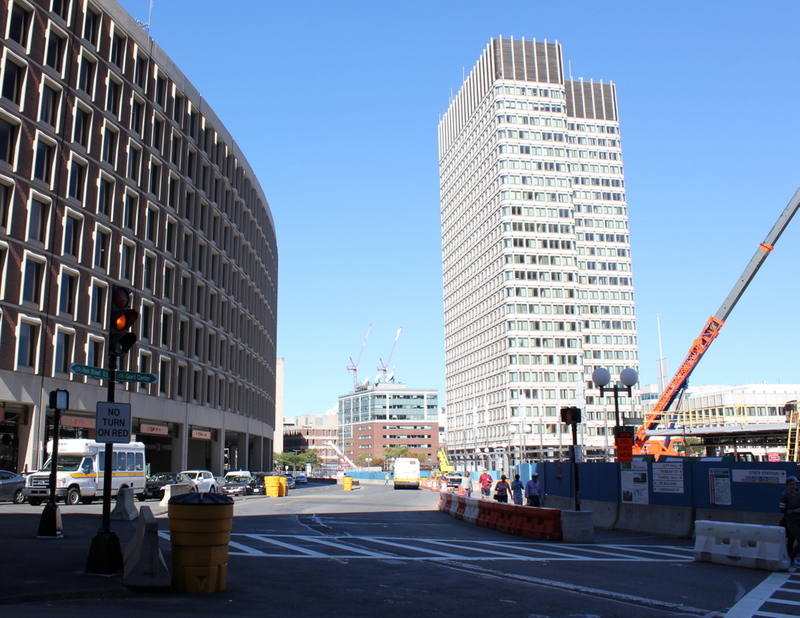 Looking to replace the area with something more respectable, the Boston Redevelopment Authority demolished over a thousand buildings in the vicinity to build the Government Center complex, which includes the Center Plaza to the left, the John F. Kennedy Federal Building in the center, and the Boston City Hall, just out of view to the right. The old Scollay Square subway station was also extensively renovated and renamed Government Center. When the last photo was taken, the station was undergoing a another renovation, so if there is one thing that the second and fourth photos have in common, it is subway station construction. 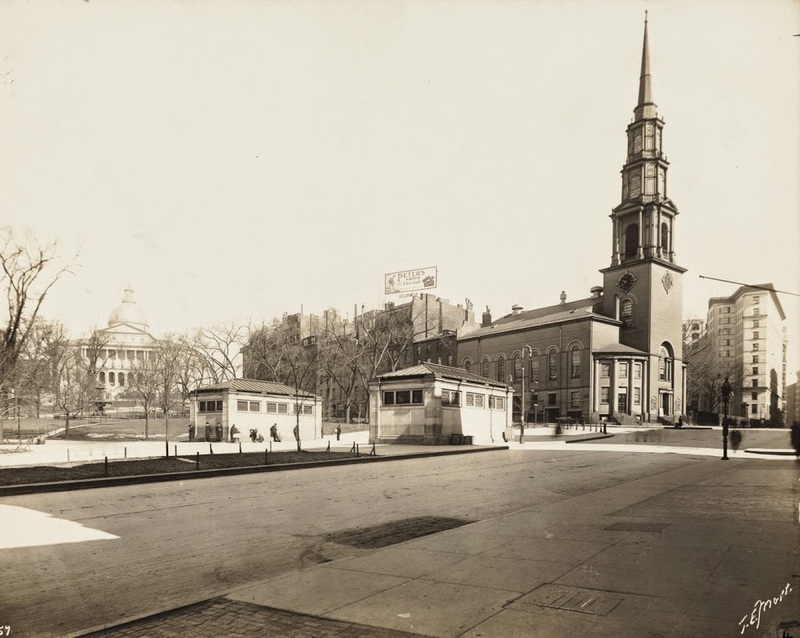 The Cathedral Church of St. Paul on Tremont Street in Boston, around 1900-1910. Image courtesy of the Library of Congress, Detroit Publishing Company Collection. 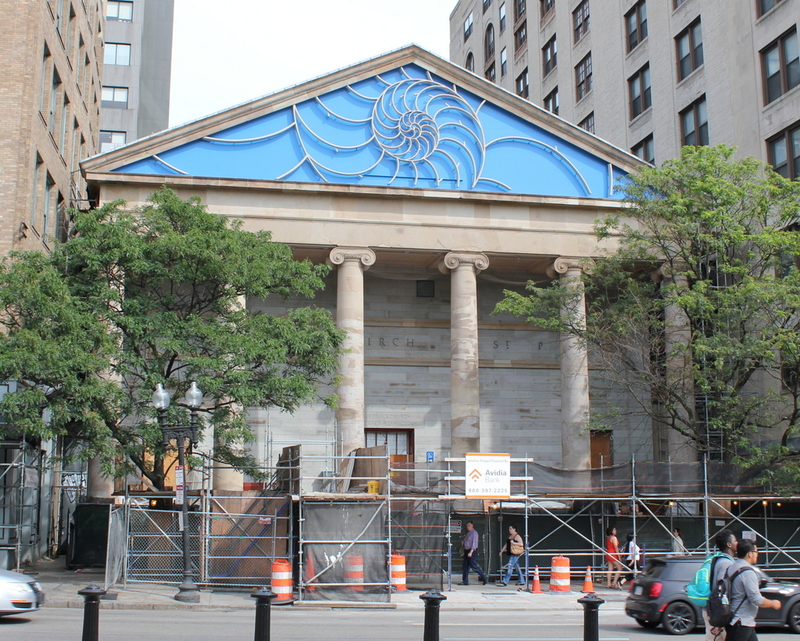 This historic church was built in 1819 as St. Paul’s Church, making it the third Episcopal congregation in the city after Old North Church and Trinity Church. 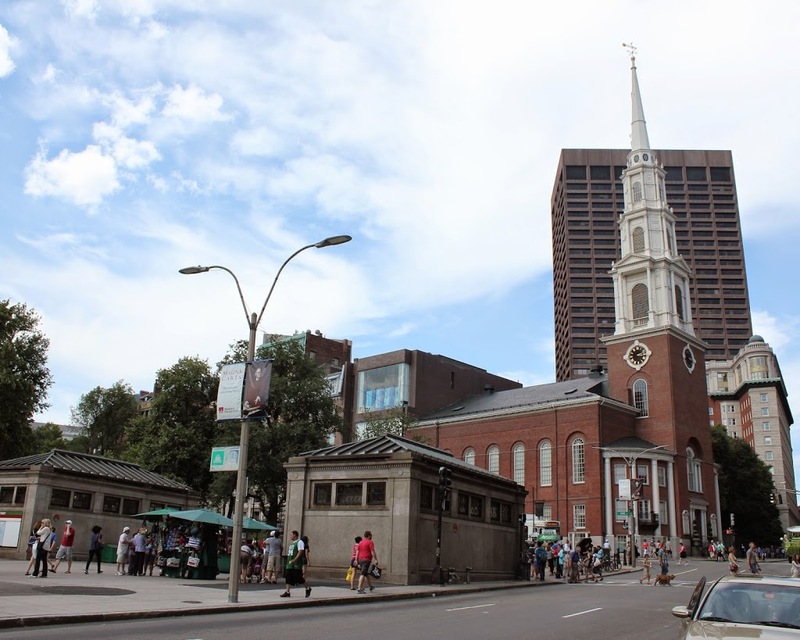 It was designed in the Greek Revival style by Alexander Parris, whose other works in the Boston area include the United First Parish Church in Quincy as well as Quincy Market in Boston. 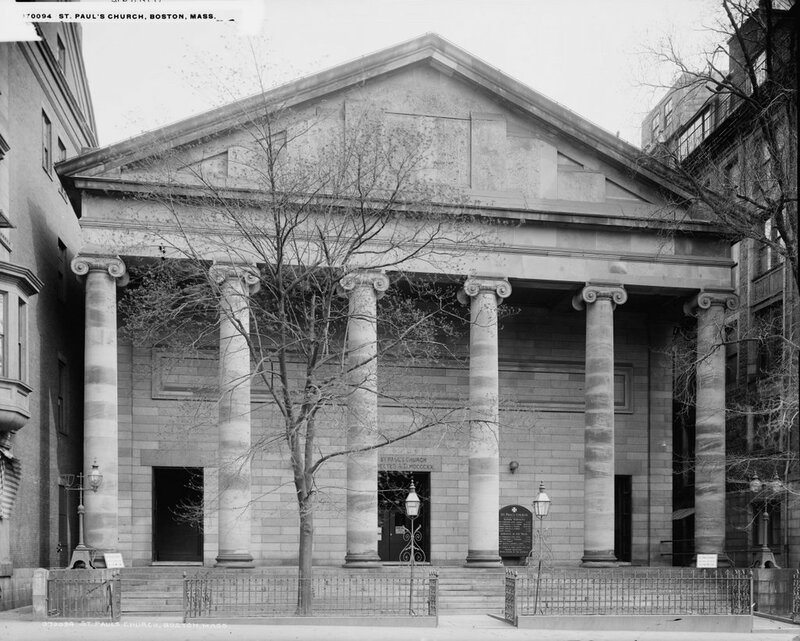 All three of these buildings still stand today, and all of them clearly show the Greek Revival influence of Parris’s work. The Boylston subway station, at the corner of Tremont and Boylston Streets in Boston, on August 12, 1897. Image courtesy of the City of Boston Archives. The first photo captures the ending of one era and the beginning of another. 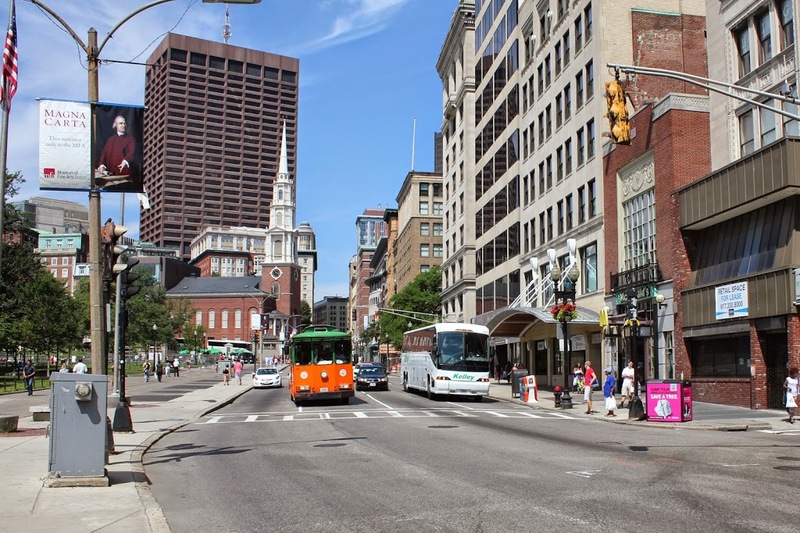 Just a few weeks after the photo was taken, the trolleys that are seen here on congested Tremont Street would be moved underground, giving Boston the distinction of having the country’s first subway tunnel. 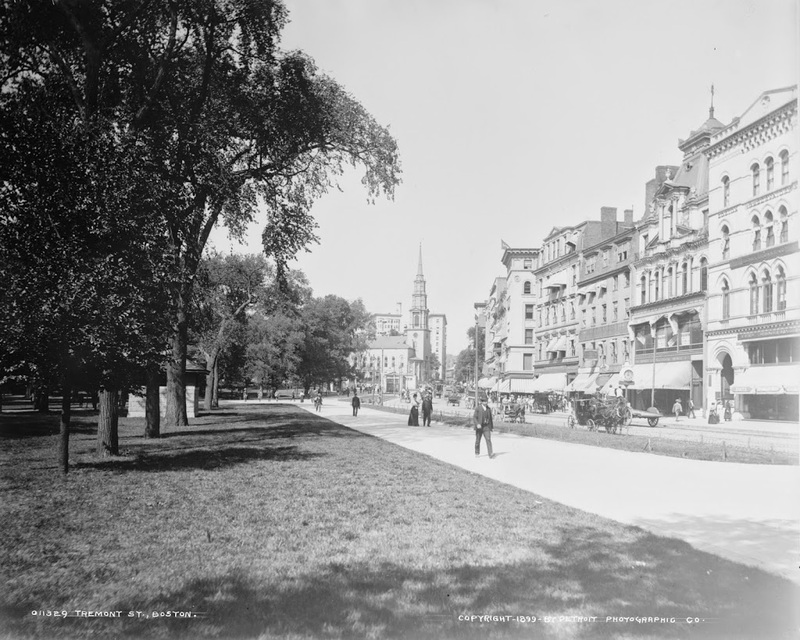 The first two stations were Park Street, just over a quarter mile to the north, and this one here at Boylston Street, in the southeast corner of Boston Common. The project was a major civil engineering milestone, but it didn’t come without tragedy. At this location earlier in the year, a leaking gas line in the work area under the intersection caused an explosion that killed six people. The explosion is explained further in this post, which features photos that were taken diagonally across the street from here. Today, the view really hasn’t changed too much. 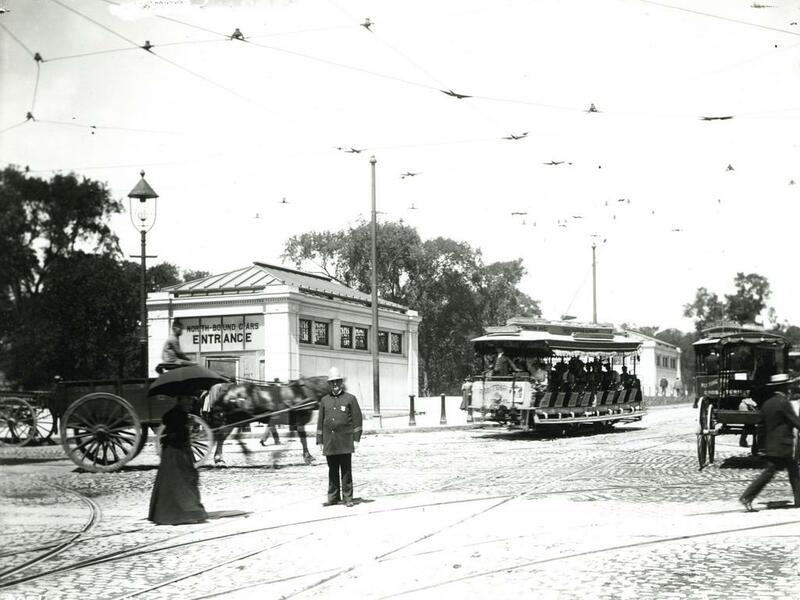 The trolleys on the Green Line are still running under this intersection, the distinctive station entrances are still here, as is Boston Common in the background. 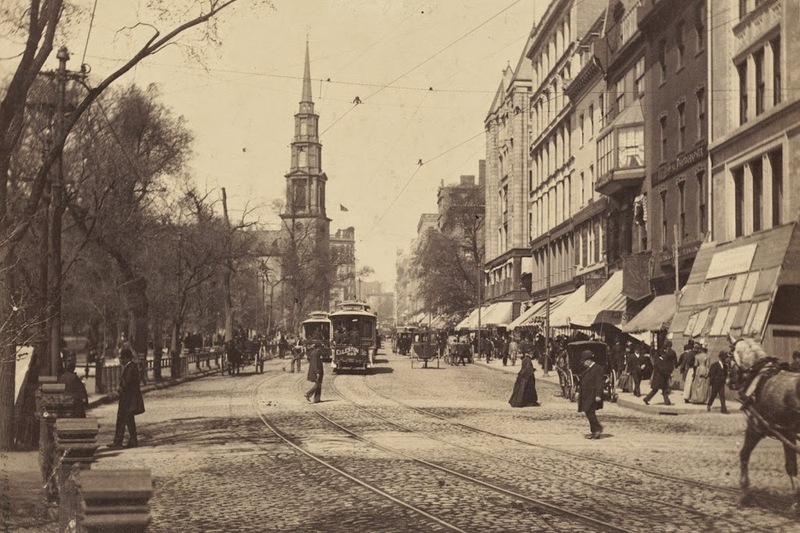 Even in the 19th century, this intersection of Boylston and Tremont streets was busy, necessitating the police officer in the left center of the 1897 photo. The slow shutter speed of the camera has blurred most of the traffic around him, but he is standing perfectly still, posing for the photographer as trolleys, carriages, and pedestrians pass by. It is still a major intersection today, albeit without the nostalgia of a 19th century officer directing traffic on a cobblestone street. Tremont Street during construction of the Park Street subway station in 1897. Photo courtesy of Boston Public Library. Park Street Station after completion, taken in 1906. Photo courtesy of Boston Public Library. 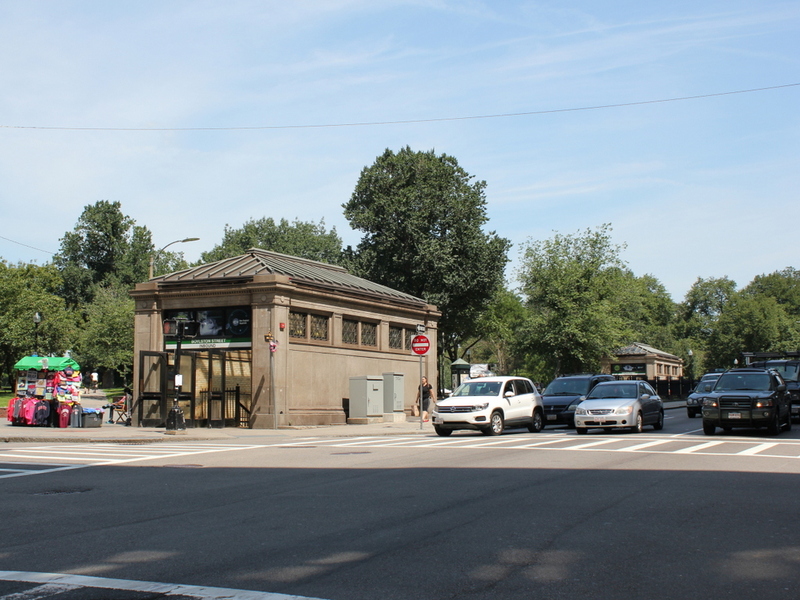 As mentioned in previous posts, the Tremont Street Subway (today’s MBTA Green Line) was the first subway in the country, and Park Street was one of the first two stations, along with Boylston. The station opened in 1897, and helped to relieve congestion on Tremont Street by removing the trolleys from the surface, as seen in the first photo. Today, the station is still there, as is Park Street Church behind it. See this post and this post for a few photos of the interior of the station.